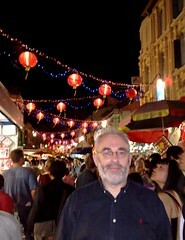 The celebrations for Chinese New Year (it’s going to be the Year of the Rat) are about to begin so I went out last night to join in the fun here in Singapore — and an excellent night out was had by all, I have to add. Wandering through some of the market stalls in the evening, I came across a stall selling “lucky coins”. Naturally, I bought some. It turned out to be lucky for the stall owner (who got $2 for three old coins worth, essentially, nothing) and lucky for me too, because they gave me something to write about on the blog when I couldn’t think of anything else. The coins were cash, in the truest sense of the word. 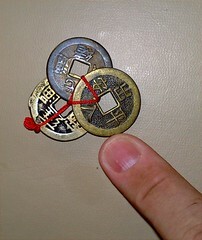 The wén (Traditional Chinese: 文, English: cash) was the currency of China from 6th Century BC until 1889 AD and continued to circulate into the 20th century. “The emperor’s mint then is in this same city of Cambaluc, and the way it [money] is wrought is such that you might say he has the secret of alchemy in perfection, and you would be right. For he makes his money after this fashion. He makes them take of the bark of a certain tree, in fact of the mulberry tree, the leaves of which are the food of the silkworms, these trees being so numerous that the whole districts are full of them. What they take is a certain fine white bast or skin which lies between the wood of the tree and the thick outer bark, and this they make into something resembling sheets of paper, but black. When these sheets have been prepared they are cut up into pieces of different sizes. Population and trade had greatly increased, but the emissions of paper notes were suffered to largely outrun both, and the inevitable consequence was depreciation. All the beneficial effects of a currency which is allowed to expand with a growth of population and trade were now turned into those evil effects that flow from a currency emitted in excess of such growth. These effects were not slow to develop themselves. Excessive and too rapid augmentation of the currency, resulted in the entire subversion of the old order of society. The best families in the empire were ruined, a new set of men came into the control of public affairs, and the country became the scene of internecine warfare and confusion. Whoops. Best stick with the either metal cash or the virtual stuff. Believe it or not, but I do have those coins that you have above placed in my bank savings account books.